Albright was born Marie Jean “Madlenka” Korbel on May 15, 1937, in Prague, Czechoslovakia. Her father, Josef, was a member of the Czechoslovak Foreign Service and served as press attaché in Belgrade, Yugoslavia and later became Ambassador to Yugoslavia. After the communist coup in 1948, the family immigrated to Denver, Colorado. 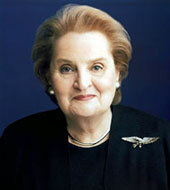 Albright Americanized her name to Madeleine, became a U.S. citizen in 1957, and earned a B.A. in political science with honors from Wellesley College in 1959. She earned the Ph.D. in Public Law and Government at Columbia University in 1976. Albright served as chief legislative assistant to Senator Edmund Muskie (D-Me) from 1976 to 1978. From 1978 to 1981, she served as a staff member in the White House under President Jimmy Carter and on the National Security Council under National Security Adviser Zbigniew Brzezinski. In 1982 she was appointed Research Professor of International Affairs at Georgetown University’s School of Foreign Service and Director of its Women in Foreign Service Program. In 1993 she was appointed Ambassador to the United Nations by President Clinton and served in the position until her appointment as Secretary of State in 1996.